The view from my sitting room window - it is the 'i360', Brighton's latest attraction. The chimney-like structure which has taken over year to erect it now has a shiny glass pod for passengers that will slowly ascends and descend, they have been practising. 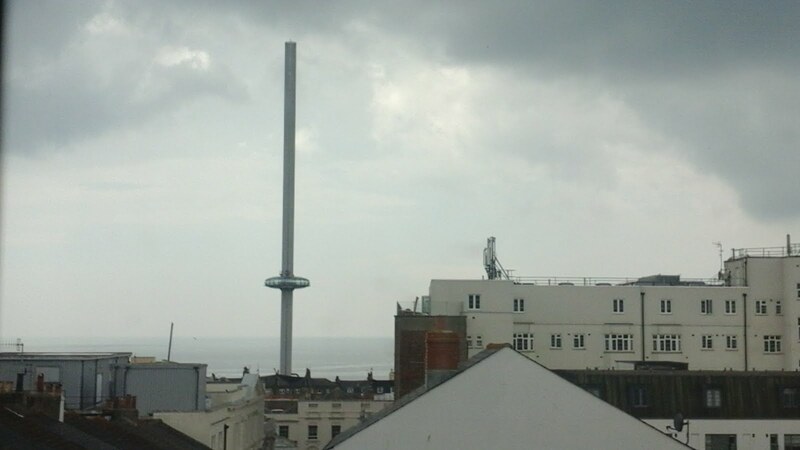 Its a grey shiny doughnut that goes up and down a dull grey stick of Brighton rock. Today through the mist one can look out on grey Brighton to the north and to the south, out at sea, to the wind farm which minces our incoming birds. Not quite as exciting as the Blackpool Tower, or even Portsmouth's Spinnaker Tower or even Weston's Dismaland - where is Banksy when you need him? It really is hideous isn't it? I think the nickname 'the i-sore' is a clever invention by someone! It is not much diferent from the Shoreham chimneys which were regarded locally as another eyesore until they were demolished to everyones delight. Some people remind us that when the Eiffel Tower in Paris was built there was an outcry about it being a blot on the landscape etc and look at it now. But at least the Paris landmark is graceful to look at by day and spectacular at night - I really can't say that of the pole and doughnut! I understand us locals will get reduced fares but I for one will not be taking advantage of them as I can't stand heights. At least it is not a minaret. Apparently Jules Verne hated the Eiffel Tower so much he ate lunch there every day as it was the only place in Paris you couldn't see it.